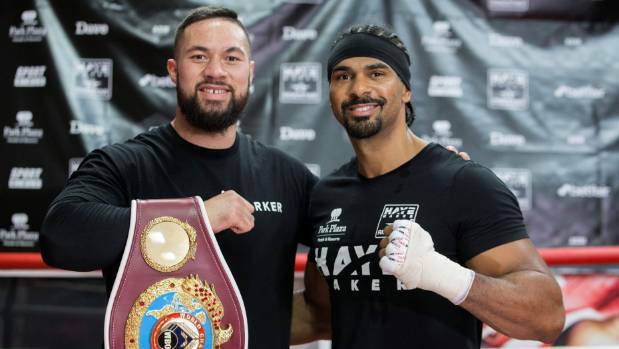 Joseph Parker’s promoter David Higgins has confirmed the Kiwi heavyweight is due to train at retired British boxer David Haye’s gym again ahead of facing Dillian Whyte in London later this month. Parker has previously trained at Haye’s base in London when preparing to fight Anthony Joshua in the heavyweight world title unification bout the 26-year-old New Zealander lost on points in Cardiff on April 1. Higgins said Haye, 37, who announced his retirement in June, had always been “very accommodating” for Parker. “Same as usual, Park Plaza, the Riverbank hotel, and as far as I know, he’ll be using the same David Haye gym,” he told the UK’s Sky Sports ahead of Parker’s next fight against Haye’s fellow Brit Whyte at London’s 02 Arena on July 28. “David seems to have been very good to us from our first fight up there. David’s been very helpful, we’re very grateful. Parker, the former WBO champion, is set to spend the final two weeks of preparation for fighting Whyte on his home turf at Haye’s gym. Their records are almost identical; Parker is 24-1 and Whyte is 23-1. Parker has won 18 by knockout; Whyte 17. Haye, a former WBA heavyweight champion, finished his career 28-4 with 26 victories via knockout.